Had a very satisfying dinner this evening… simple and quick to make and let me tell you my belly is very full indeed after eating this meal. I had intended to make a dessert but in the end I had a handful of wild blueberries.. I always half fill my dinner plate with fresh veg and I served my mince slices with steamed cauliflower and string beans with a small shaving of salted organic butter on top. 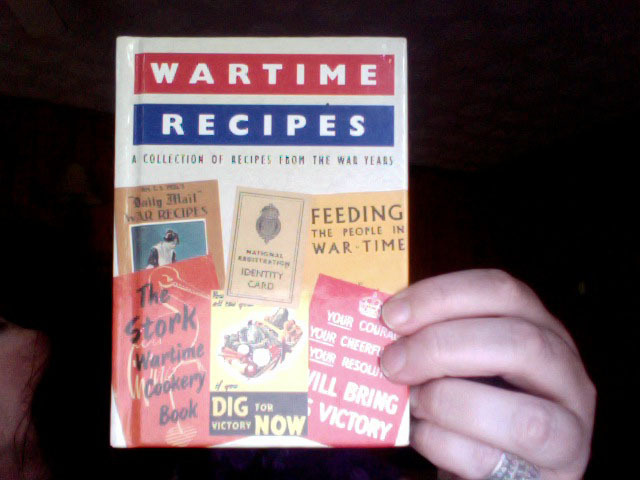 PS Oh I nearly forgot to say I got the recipe from this little pocket book.. 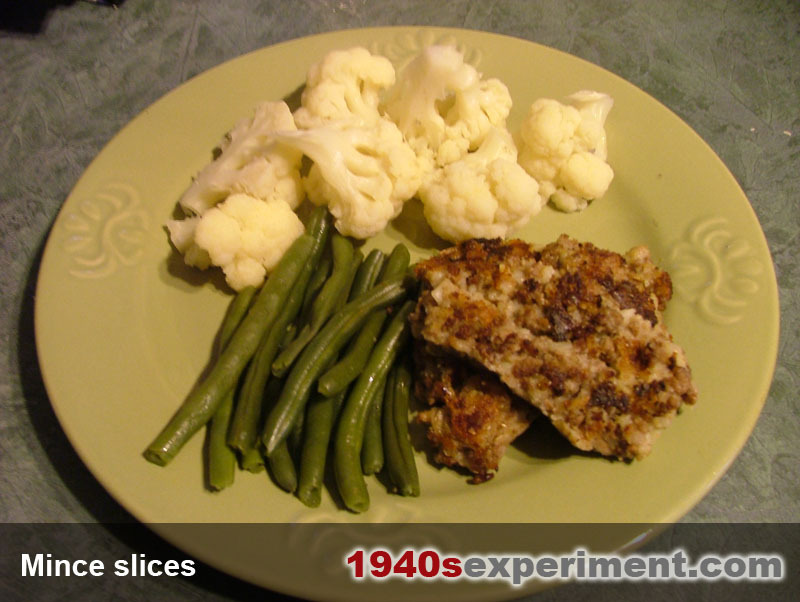 This entry was posted in Uncategorized and tagged 1940s experiment, 1940s recipes, carolyn ekins, mince slices, WWII. Bookmark the permalink. I made this for dinner tonight. My roommate and I both liked it. The mixture didn’t want to hold together, so since I am not following a ration diet, I added a beaten egg to bind it a bit more. We had it with mashed turnips (my first time making turnips!) and some leftover roasted brussels sprouts. I “shave” the brussel sprouts in the food processor with the slicing blade, then toss with a little oil (1 T or so for a pound of sprouts), a minced shallot, and salt & pepper, spread out on a baking sheet and roast for about 25-30 min at 350F, stirring a couple times. So delicious I’ve had the leftovers as a snack. Wow! That sounds great, I’m busy finding “cheap and cheerful” recipes at the moment and that’s a deffo for me!! Carolyn, wanted to let you know we found a book called “The Ration Book DIet” by Brown, Harris and Jackson.